In addition to Bonilla, the video also features Jon Beavers, Patrick Schwarzenegger and Carter Redwood. The clip follows Lt. Aguero right after he’s been shot on the battlefield, and is laying on the ground. But his fellow officers soon discover that the bullet that was fired at Lt. Aguero by their enemies didn’t penetrate his skin, and he will be fine, which proves that he’ll never abandon hope. ‘The Long Road Home’ chronicles the events of April 4, 2004, when a platoon was ambushed in Sadr City, Baghdad, in an attack that came to be known as “Black Sunday.” The event series cuts between the action on the ground in Iraq and that on the homefront back in Texas, where wives and families await news for 48 hellish hours, expecting the worst. The show is based on author and ABC News Chief Global Affairs Correspondent Martha Raddatz‘s book about the attacks, which is titled ‘The Long Road Home: A Story of War and Family.’ The book has become a New York Times and Washington Post best-seller. ‘The Long Road Home’ stars Michael Kelly as Lt. Col. Gary Volesky, the battalion commander who leads a daring rescue operation when the 1st Cavalry Division comes under attack by Iraqi insurgents. Jason Ritter portrays Capt. Troy Denomy, who leads the rescue convoys into the city following the dramatic ambush of the 1st Cavalry Division Platoon, and is a devoted family man with a wife and newborn son. Kate Bosworth is cast as Capt. Denomy’s wife, Gina. Sarah Wayne Callies plays LeAnn Volesky, who’s the wife of Lt. Col. Volesky, and a leader in the family readiness community. 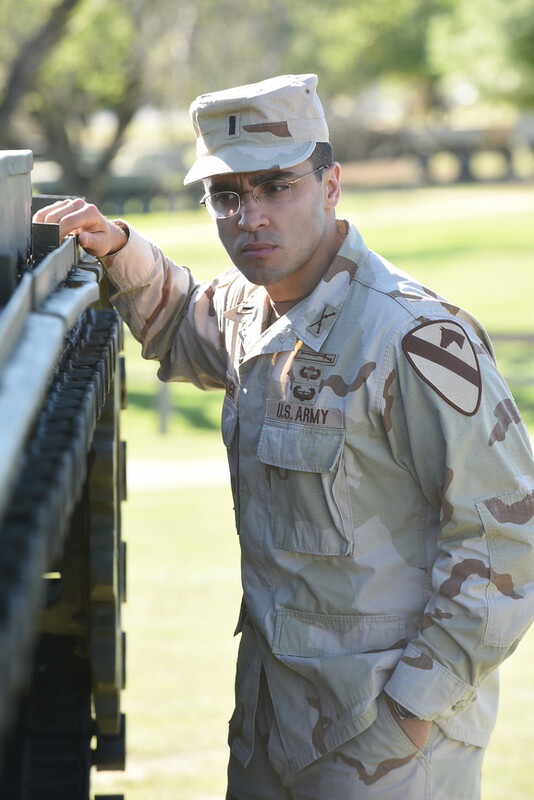 Bonilla portrays Lt. Shane Aguero, the leader of the ambushed men. Noel Fisher is cast as Pfc. Tomas Young, the heroic 24-year-old soldier and later peace activist who is severely wounded in this battle. Jeremy Sisto has taken on the role of Staff Sgt. Robert Miltenberger, a career soldier on the cusp of retirement who has been stop-lossed for this deployment. Shockya is premiering an exclusive clip from the seventh installment of National Geographic's acclaimed mini-series, 'The Long Road Home,' which features actors E.J. Bonilla, Jon Beavers, Patrick Schwarzenegger and Carter Redwood.